All transactions are safe and secure with a reliable history in online purchasing behind each of our associates. 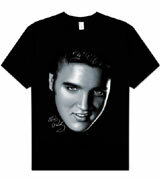 Buy the Elvis Presley Face t-shirt to own Elvis clothing and merchandise. "Baby let me be, your lovin' teddy bear. Put a chain around my neck and lead me anywhere. Oh let me be, your teddy bear." With the lovable face shown on this Elvis t-shirt, I see why most girls would have let him be their teddy bear. Despite being considered vulgar by most adults during his heyday, girls screamed for him and chased him around any time the opportunity presented itself. Live their dream and get as much Elvis merchandise as you want. In addition to the Elvis Presley Face tee above, browse the Elvis Clothing Gallery for more apparel like men's and women's clothes, kids shirts or hoodies.